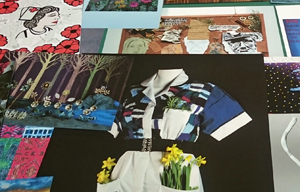 Nuture - An exciting creative collaboration between Gwent Arts in Health and students from the BA(Hons) Creative and Therapeutic Arts degree at the University of South Wales. This year, Gwent Arts in Health (GARTH) invited Year 2 students from the BA(Hons) Creative and Therapeutic Arts degree to respond to an exciting professional brief. Students were invited to create artwork for the corridors of St Woolos hospital that both brightened the walls and celebrated the work done by the nurses of the hospital. Each Creative and Therapeutic Arts student has explored a different side of the brief but every one of them has drawn on visits to the hospital, historical research and very importantly, dialogues with the nurses of St Woolos themselves. This was a valuable opportunity for students to develop their understanding of the therapeutic potential of art works in hospitals through professional engagement with the established arts in health organisation, Gwent Arts in Health. The students are very thankful to have been in contact with members of the nursing profession at St Woolos whose insight and personal stories have provided much of the inspiration for this exhibition. Key themes that emerged from these exchanges were the nurse as compassionate, nurturing and resilient – a person working for the greater good through compassion and teamwork.